Mix Mashed potatoes, 3/4th of peas, all masala powder, soy sauce & salt. Adjust salt to taste. Knead it with out lumps as we do for chapati dough. Divide potato mixture in to equal size balls ( You will get 13 ~ 14 balls for this measurement) 7 keep it aside. Mix All purpose flour, corn flour, salt with required water and make it as thick batter as we do for bhaji batter. Take vermicellli in a plate or bowl & keep it ready. Gently press the balls to give nest like shape & make gentle thumb impression on middle of the ball. 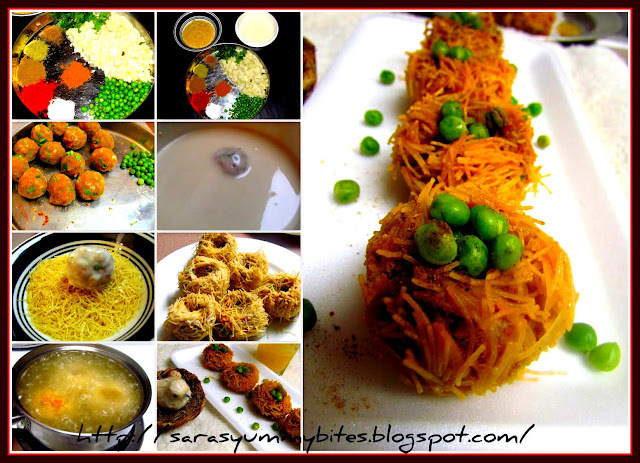 Dip potato balls in all purpose flour batter & roll it on vermicelli . Rest it in refrigerator for minimum 15 minutes to set. Heat oil in a pan or kadai & drop the prepared balls & fry till it turns golden brown colour. Sprinkle chat masala on rest of the peas & drop it in middle of the potato nest balls to make it to appear as a birds eggs. Serve with Tomato ketchup or Ranch.. This birds nest makes me nostalgic, love this..Those edible nests looks soo cute and adorable Sara.. Very very cute nests. I really liked the way they look. This is absolutely superb... the presentation is wonderful.... sure hit with the kids... lovely..
they look so cute...great job on this..i am sure they tasted great too! What an innovative idea saras.. they are looking wonderful..
Looks super delicious and cute,kids will love it. Awesome presentation and a tempting one too...shall try it out sometime!! Super duper Saras, Kalakureenga,,,I've never made this, But saw this in vijay tv's samayal samayal...Saras, Am gonna this recipe soon..Thanks for the collage,It really helps.. This looks so good... amazing clicks! Beautiful Saras! very inviting platter and am sure you son was very excited to eat this..
Those are surely super cute dear and I love your presentation, specially your birdies in their nests with eggs, super duper cute. What a fantastic presentation dear..loving everything in it!! Love the way how u presented looks os delicious and beautiful..
A small question? Don't the vermicelli break and drop into the oil while frying? What an amazing recipe!! Love the pictures too! Thanks a lot friends for all your comment & support. Suma, few may come out, but it wont spoil the texture.. It looks amazing. i can imagine how kids would just love this. Looks so pretty.Am sure kids will love it. Hi dear, these nests looks so cute. i also use to make this kind of nests while i was in 10th standard. but that was bit different. i will try this one. Кeep on working, gгeat job!